Did you miss any of the giant "Ponyzilla" releases, particularly the notoriously difficult to find Applejack? Well, weep no more, my tender lumplings! Both Dollar General and Family Dollar are selling them this year for Christmas! I'm seen all but Fluttershy and since I am in a very rural area, this is no surprise. I'm sure the larger areas have them all. The packaging is slightly different from the first releases, but paying $10 new beats eBay prices any day! And joy of joys, I was able to complete my set at last, with the purchase of AJ. So run to the stores! BUY ALL DA PONIES!!!! I wish! Oh they'd be so much fun! We don't have those stores either. If anyone needs a certain pony, let me know and I'll try to grab them for you! I wish I had any of them. ummm not to admit my ignorance but what is a ponyzilla? At first I was thinking you were talking about the yard decorations. I really need some help people. A picture would be great. I don't think I have ever known what a ponyzilla is or Walking Dead has caused some brain cell loss. Well, I mean, it is all about brain eating zombie hordes. To answer your question, they're the really big fashion style G4s. I think their closest equivalent would be the G3 Styling Ponies. 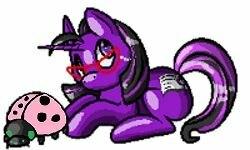 A funny thing about the Ponyzillas... they're bigger than fashion styles, but only cost 10 bucks compared to the 15 to 20 for a fashion style. I know the FS have clothes, but I never use those much. I would say that 99% of my ponies don't have their clothing on or the accessories they came with. I have a big bag full of accessories. That's kinda weird price-wise, but whatev. for a visual example... 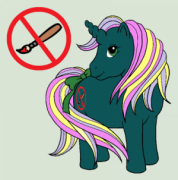 Here's what I'm guessing people are referring to, as Ponyzillas... next to a G4 Fashion Style, and a regular G4 brushable. Should your glitter Pinkie go missing, I have no idea what happened. Whoa, she's huge! Your glitter Pinkie is real pretty btw. If you really can do this, that'd be awesome! I know shipping will be super expensive, with how large the box(es) would be, but... if you can manage to find any of these (some might be impossible, IDK), I'd be super thankful!